Representing history in France had always been fraught with difficulty for centuries. Not until the Third Republic (1870-1940) was it possible to report, write or make art without the threatening overhang of censorship, but, after the Franco-Prussian War, the cultural producers felt the heavy hand of social responsibility on their collective shoulders. After the Germans had determined the best way to collectively punish the French, how best to crush the spirit of the nation, it was up to the artists to depict to the new nation its fresh republican face. Although, for the most part, the avant-garde artists opted out of this post-war task, one occasionally sees a possible whiff of patriotism in Impressionist works in the wake of the war. The painter landscape painter, Claude Monet (1840-1926), returned from London where he waited out the short war and settled in the suburban village of Argenteuil, already in recovery mode by 1872. As they closed in on Paris during the final siege, the Prussians had destroyed the two old bridges that crossed the Seine, but as though to wipe out old wounds, a new iron structures, bright and shiny and modern, had defiantly sprang up. 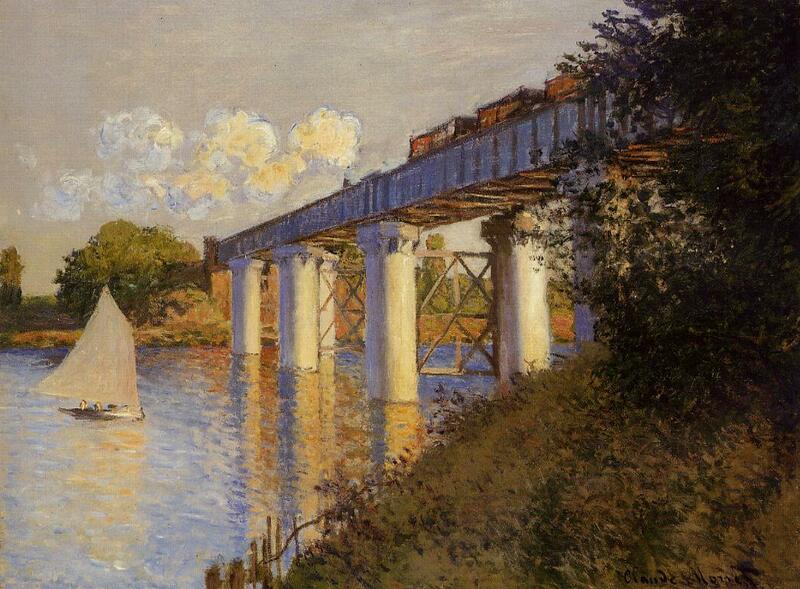 As Christoph Heinrich pointed out in Monet (2000), the two bridges were very different. The old wooden bridge was replaced with “cast iron girders, but in the reconstruction considerable emphasis was placed on giving these a decorative air, as if wrought by a craftsman’s hand. 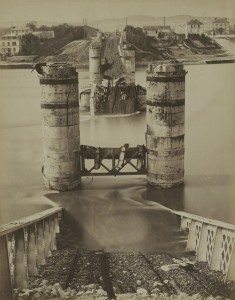 The other bridge was a railway bridge; and both its function and the concrete and precast iron parts of which it was built made it highly modern.” Monet painted the triumphal bridge seven times. While it would be a bit harsh to call an individual who was unwilling to support what was a war among rulers and empire builders as being “unpatriotic,” Monet did not participate in the war, while many of his friends did join in active combat. In his 2004 book, Impressionism: Paint and Politics, art historian John House writing of the Impressionists and their work immediately after the Franco-Prussian War stated, “Little evidence survives of a direct linkage between their choice of subjects and the pressures of the market in these years..” but as was stated in the previous posts on military painting, after the war, there was a huge and expansive visual and literary project devoted to celebrating French bravery and heroism against the Prussians. The repeated depiction of such a famous bridge, even by a renegade Impressionist, would have attracted an audience sympathetic to the content of the painting–French renewal–if not to the style of painting a notable example of rebuilding. Indeed, if one tracks Impressionism and Post-Impressionist content and subject matter (not style) with that of the academic salons, there was, for decades, a striking similarity in themes that is often overlooked in the drive to separate the avant-garde from the academy. While the local press did not care for the railway bridge at Argenteuil, writing “Instead of an elegant construction of grandiose form there is only a heavy and primitive work which is not at the level of progress, they made a wall of iron impenetrable to the eye …the bridge should be embellished with carved capitals and some cast-iron decorations to break up this relentless straight line with the taste that so gloriously characterizes our nation,” the rebuilding project signified recovery and redemption, even if it was too modern for some tastes. For the sake of argument, it is provocative and hopefully illuminating to place the bridges of Impressionist artists–Claude Monet and his bridge and Camille Pissarro and his factories–next to the vast panoramic recreations of the last stands of the heroic French Army by history painters Édouard Detaille and Alphonse de Neuville and see both bodies of post-war work as part of the vast discourse of post-war healing and renewal. There was much work to be done. While the Impressionists dabbled at the edges of national soothing, it was the military painters who, as was pointed out in previous posts, bore the main burden of redeeming the honor of the French nation in the eyes of the broader Parisian public. It is necessary to pause to make a distinction between “Paris” and the rest of “France, between the “Empire” and the “nation.” For the entire modern history of France, from the French Revolution to the Third Republic, the term “nation” was an ambivalent one: on one hand the post-monarchial governments understood that authority stemmed from Paris but on the other hand, the rest of France was not Paris, did not consider itself “French,” and, in many regions, did not speak French. After off and on attempts to unite France, frequently through military conscription, it was the Third Republic that began to seriously work on a universal educational curriculum, which aimed at eradicating regional identities for a national identity, which was “French,” i. e. Parisian, an effort that was deeply resented by its reluctant recipients. 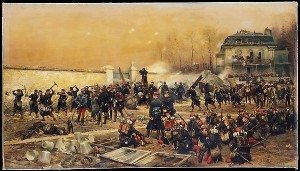 Two pupils of Ernest Meissonier (1815-1891), Édouard Detaille (1848-1912) and Alphonse de Neuville (1835-1885), teamed up to paint two huge panoramic vistas of two fierce battles, one fought hand to hand house to house at the very doorstep of Paris, near the Marne, the other full of flash and dash and bad leadership on the part of the French generals. 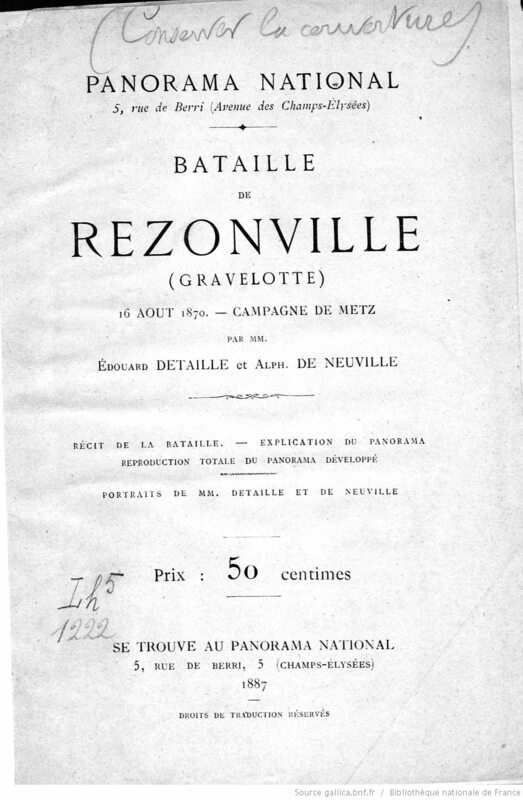 These battles, Champigny and Rezonville, were celebrated memories, not because they ended well–the defeated French either surrendered or retreated into the city of Paris–but because these skirmishes were the last desperate struggles of a valiant and outnumbered French army, or what was left of it, fighting for honor, not glory. The first panoramic production featured the dramatic fighting at Champigny in the vicinity of the Marne and was put on display in 1882. 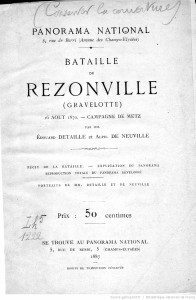 Its immense popularity inspired a second effort, this one featuring the pitched battle in the vicinity of Rezonville, outside of Metz. This 1885 production was the last major work for Neuville, who died that year. These days-long battles were among the last of traditional set pieces of Napoléonic style warfare with calvary charges over green and open fields–galloping horses ridden by dashing officers in splendid uniforms–colliding with modern military facts. 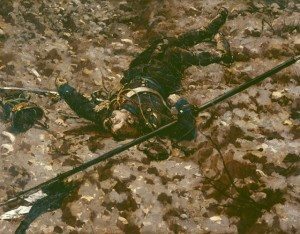 Indeed, the encounters between French and Prussian calvaries on at least two occasions were noteworthy for its futility, bloodshed, misplaced medieval gallantry in the face of mechanized weaponry. 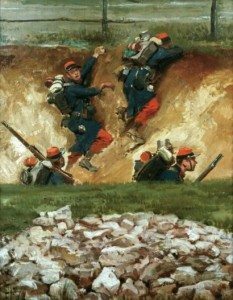 In their own ways, both battles had elements that, with hindsight, can be understood as warnings for the future–events that would repeat in the next century, especially last stands at the Marne and insane gallops into hails of bullets. Author of The Panorama (2003), Bernard Comment, who found the quotation, noted that “During the first four months, takings for the Battle of Champigny were 400,000 francs. The cost of entry was two francs, and attendance averaged out around sixteen hundred visitors a day.” The Franco-Prussian War had ended (badly) a decade ago, but the French audience clearly still needed comforting. The two artists followed the methods learned from Meissonier, precision and accuracy as appropriate to history painting, still the best way to illustrate contemporary events in all the color and complexity. Although Detaille had been present during the defense of Paris, he joined Neuville at the sites where the battle had taken place. Dividing the territory between them, the artists made detailed sketches, worked up more precise studies, and then took photographs of the final version of each section. Neuville was in charge of the overall composition, while Detaille created various small incidents and scenes, bits of action among the soldiers to place in the wide terrain. The days long struggle to break the German lines as described by Atteridge were the basis for the scenes depicted by the artists ten years later. From the scenes that have survived from the panorama, it is possible to state that the many tableaux seem to be very close illustrations of the numerous small and intense actions that made up the entirety of the failed sortie. The multiple sections, combining Detaille’s actions inside of Neuville’s panoramic design, were then projected, by magic lantern, onto the canvas which was stretched along the long wall of the panorama building. Working like Renaissance masters, the military painters took responsibility for the hundreds of figures, while their assistants painted the backgrounds and the skies. The fifty foot high and four hundred feet long painted canvas weighed two tons and, when mounted on the wall was “read” and viewed by visitors who walked along a raised platform. Each visitor had a guide book and could follow the various points of interest and vicariously participate in the combat. It must be assumed that most of the visitors were in Paris during the Siege, remembered the starvation and the siege guns battering the city. 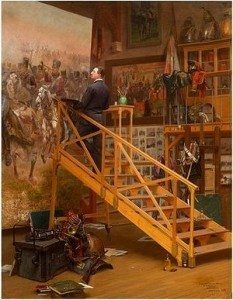 The only place the painting could be displayed in its totality was in the building that was constructed for this purpose, but even though panoramas precursors to films, cinema, they were expensive to maintain and the fad for such paintings passed. The Battle of Champigny was cut into many pieces over a period of four years, between 1892-1896, and distributed to a variety of collectors. In 2012, Sotheby’s offered some forty fragments for sale, and a preliminary painting of The Battle of Champigny is owned by the Metropolitan Museum of Art in New York, far from Paris, where this military panorama had once meant so much.